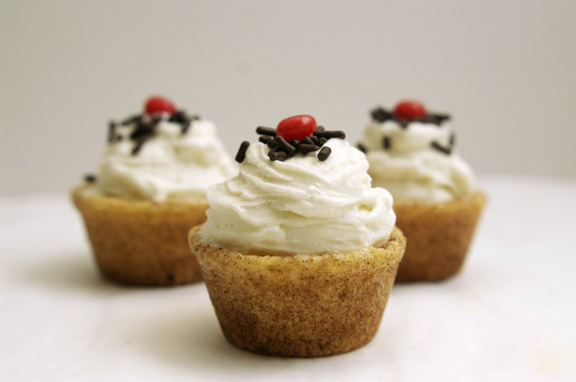 mini snickerdoodle cookie ice cream cups. Rather, what happens when you try something, it looks like it fails, and yet; it is a delicious success when repurposed. Confession: I was messing around with the baked goods again. In real life, my failures at least equal my successes. But I believe strongly in happy accidents, so I piddle away ingredients with the hope something delicious will come out of it. Much of the time, something comes out which is edible, but slightly off. And yet, sometimes…sometimes, what comes out is magnificent. Believe it or not, these mini-snickerdoodle ice cream cups started out their little lives as a failure. I started with a recipe from my much-loved and often-thumbed-through vintage Betty Crocker cookbook from the early sixties. 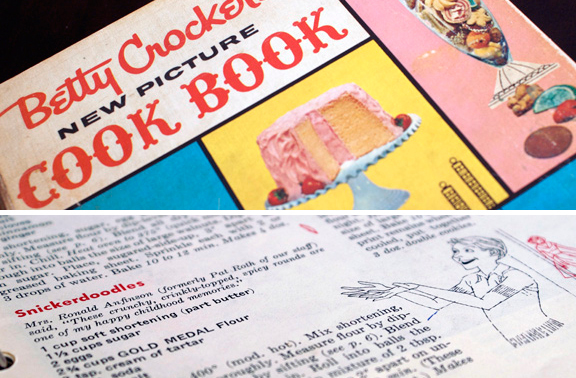 I don’t know about you, but my love for vintage cookbooks, especially from the fifties and sixties, runs deep. I am fascinated by what was popular back then (veggies encased in gelatin, anyone) versus now. 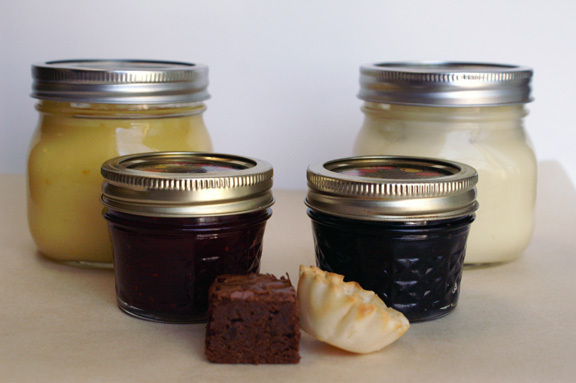 While some of the then-popular savory dishes have gone out of style, the desserts (mostly) remain fashionable. So during a recent flip-through, I saw snickerdoodles, and I had an idea. 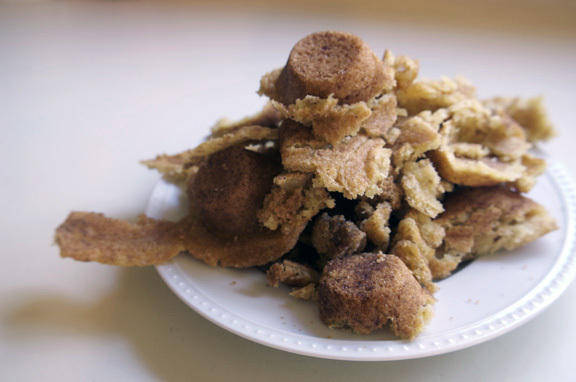 Snickerdoodles: if you’ve made them, you know they’re easy enough, right? Not any weird ingredients, the only real effort is the cinnamon sugar rolling, and so on. Well, yes and no: these cookies have cream of tartar in them. Most cookies, at least most of the ones I come across, do not. There are some unique properties to cream of tartar which I (stupidly) didn’t factor in when starting this project. You see, cream of tarter must be what gives these cookies what i like to call their “fluff-and-flat” quality. When you bake them, they begin as little balls, then they spread out so much you think you did something wrong, then they fluff up like they’re going to levitate out of your oven, and then: psssssst. flat. I had gotten it in my head that mini deep-dish snickerdoodles would make a great companion piece to the mini deep dish chocolate chip cookies. And they would, if I could only figure out how to do it correctly. And I will, and when I do, they’ll be posted for you to enjoy. For now, i’ll direct your attention to my failure. Behold; my first batch of “deep dish snickerdoodles” – thankfully, I still had half the batter waiting to go in the oven. Right. It’s a snickerdoodle massacre. I can’t believe anyone made it out alive. I made the balls to big, they fluffed themselves right over the edges, ran into each other, and then flattened out, still attached. Obviously upon seeing this, I thought, okay; fail. Then that buttery cinnamon aroma wafted towards me. I turned around. I looked at the plate of snicker-pieces. I ate one. It was delicious. It was chewy and perfect and slightly crisp on the outside but tender inside and delicious. I ate another one just to be sure I hadn’t grabbed the only edible part of the pile. NO. Still delicious. This could not be considered a failure; I would have none of it. It’s the same as disliking a person because you don’t like their outfit; it’s shallow and cruel. There had to be a way to fix these. So i halved the size of the next batch of cookie balls (see above) and went for it. This time around, the balls did their thing as usual: they spread out in the tin, then fluffed to juuuuust over the top, and…. 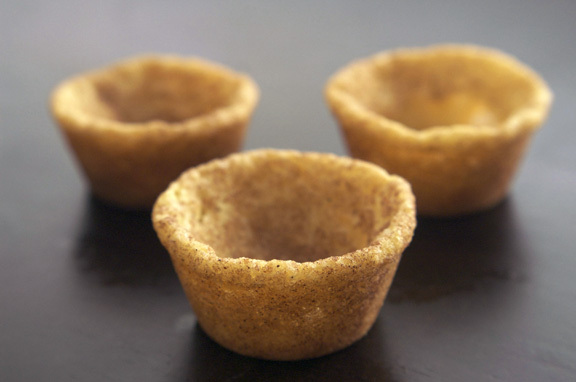 …sank back down to form perfect little snickerdoodle cups! SUCCESS! And, might I add, totally sturdy because of their crisp ouside, but not all breaky and crumbly because of their tender little soft insides. In other words, one of the most perfect vehicles for ice cream I could think of. Because snickerdodles, if you think about it, sort of taste like they belong with ice cream, right? When I eat them, I end up craving either milk or a great, simple vanilla ice cream to go alongside. So simple vanilla it was. I tried to think of an ice cream I could make that was fancy, or different, but my sister whipped me right into shape by suggesting I stick to a straightforward vanilla. And she was totally right; I’m happy I listened. My favorite type of vanilla ice cream is vanilla bean, but if you are more of a french vanilla type of person, I’m sure that would be lovely as well. As for the decorations, I couldn’t resist. Especially the cinnamon red hots, which to me complemented the cinnamon in the snickerdoodle cup. I used chocolate jimmies, but regular rainbow sprinkles would work well too. My word of warning: do watch these carefully, at least your first batch, to establish exactly how much time you’ll need. When they sink down, they’re done. You want them crispy/tender, not crispy/hard. Adapted from The Betty Crocker ‘New Picture’ Cookbook, circa early 1960’s. It’s so much more than fabulous. I’ll share some of the “helpful hints” with you in future posts. Good-quality vanilla bean ice cream (or any sort of vanilla, really.) Not a vanilla person? Use any ice cream you feel would go well with a cinnamon-y cookie. Preheat oven to 350˚F. In a large bowl, whisk together flour, cream of tartar, baking soda, and salt. Set aside. Cream butter and sugar together on high speed using a stand mixer fitted with the paddle attachment or a hand mixer, 2-3 minutes. Add eggs and beat for 1 minute more. Add flour mixture in 2 parts, mixing on low speed after each addition until incorporated. Do not over mix. Stir together the 1/4 cup sugar and the cinnamon until evenly distributed, then pour into a wide, shallow bowl or lipped plate. Using your hands and the memory of my failed first batch to guide you, form the dough into small balls, around 3/4 inch in diameter, or even a bit smaller. Just do a few at a time. If you need extra help, see my photo above for reference. Your balls should look like the “yes” photo. And isn’t that the truth. 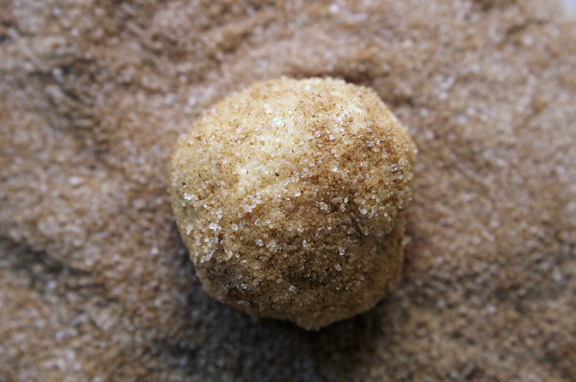 Take your balls and roll them in the cinnamon sugar mixture. I’m never going to make it through this post without laughing; I must be tired today. Ignore me. Place the cinnamon sugar balls in the mini-muffin tin as pictured above, and place in the oven for about 8 minutes or so, watching after the 6-7 minute mark to see where you are in the fluff/flat process. Once they puff, then should flatten, and once they flatten down, you’ll see little cups form. They should be done at this point. Remove from oven and place the pan on a wire rack to cool at least 15 minutes. After 15 or so minutes, you can start removing your ice cream cups. I used a thin-bladed knife to slide down each of them and sort of pop them out, being careful not to dent the cups much. I would suggest that method, as trying to overturn them could lead to mass destruction. Once completely cooled, scoop little scoops of ice cream into the cups using a melon-baller. Top with your favorite toppings or the ones I suggested above. The cups will keep for 2-3 days at room temperature. 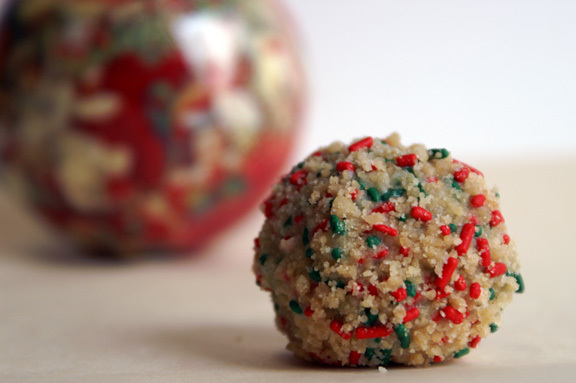 I wouldn’t suggest freezing them: the flavor stays, but the texture goes crumbly on you. Store in an airtight container on your countertop. thanks, natalie! 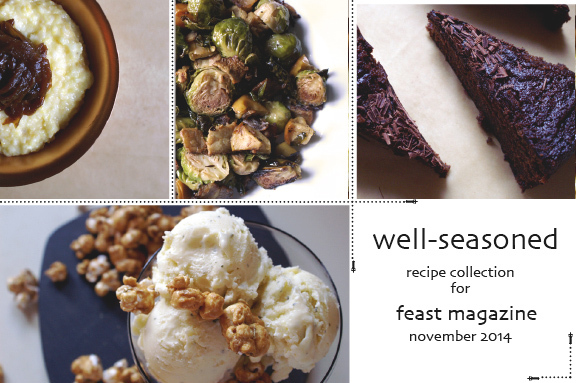 and what a great idea for a topping…we snacked our way through quite a bit of the “failures” bunch, and i whirled the rest around in my food processor to experiment with later. There are no failures when cookies are involved. They don’t even have to be pretty for me to eat them. I have a feeling that my waistline is going to grow just by looking at your blog. if your waistline grows, then join the club; i have to put in equal parts gym time and cooking due to “excessive and meticulous taste-testing” at the house. and you’re right: even if your cookies end up in one massive blob, but they taste good, who cares. just means you can’t give them to anyone. 🙂 thank yoooou. Whoa. Whoooooa. This is such a genius idea! I first thought you were going to turn the crumbs into a crunch to use in a Milk Bar-esque recipe, but you kept on and you nailed it! It’s crazy what a wee bit of tinkering can do. Now I’m going to go contemplate the sheer wonder of this concept. I just love it! reading my mind! as i sit here having just thrown out my pulverized snickerdoodle fail crumbs…because i did ponder that (as well as a snickerdoodle ice cream), but they went stale before i could use them. looks like i have to make another batch! if i make something momofuku-ish out of them, and it works, i’m dedicating it to you. and people shun the betty crocker (i’ve heard it), but i think it’s the best go-to cookbook for the standards.